Popular anime torrent site NYAA has lost control over its Swedish .SE domain name, which was deactivated a few hours ago. As a result, the site has become unreachable. The domain status suggests that the responsible registry intervened, which is something that could happen in response to a copyright-related court order. Update: The NYAAtorrents.org and NYAA.eu domains are also deactivated now. This suggested that there’s a coordinated action involving multiple domain name registries. 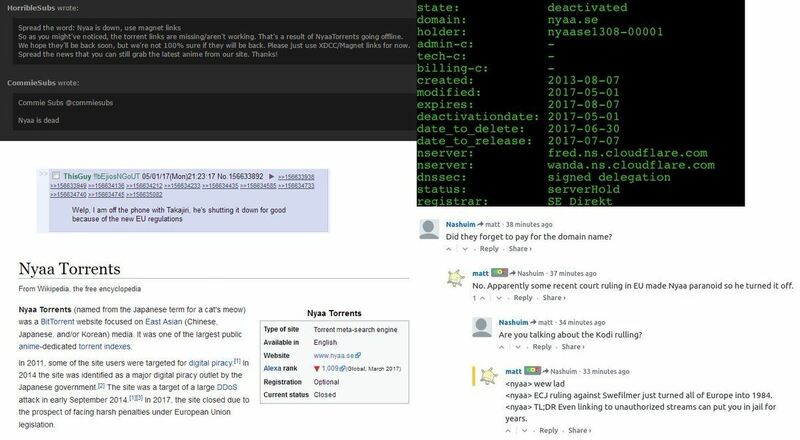 We can only speculate, but given that the domains were registered through different companies, manual removal by the owner would be a plausible explanation at this point. Since all of our anime releases and promos were done through Nyaa, this breaking news was worth mentioning here. Any further updates and developments will be added to the Torrent Freak article. Since it’s confirmed, by all reasonable accounts, that Nyaa is gone for good, we will be discussing internally what we’ll do with all the Nyaa links we’ve shared over time. This will take some time to sort out. Our apologies in the interim. This entry was posted in fansub, News and tagged anime torrents, nyaa.se. Bookmark the permalink. This is really disheartening because most of my favorite series are not licensed, so torrent is the only way I can get them. That was a great site. Well, there goes seven years of pleasure. Cut off one head, two more shall take its place. HAIL HYDRA! I found this website for example although unfortunately it was written in mandarin. Anyone that is fluent in mandarin might be able to help me reconfirm on whether this can be used as Nyaa replacement after all? Seems to have a copy of the non-adult Nyaa catalogue, including the descriptions. Another Nyaa ressurection site (could be good, although the search didn’t work for me).